The DMXcat’s interface device is a compact battery powered unit which fits easily in a pocket or tool pouch or may be worn on a belt. It uses Bluetooth LE technology for communication with the smartphone/applications (up to 50’ range). Without the limitations of being physically connected, the user can move about the workspace as needed with his/her smartphone and run the various apps while still using the phone for on-the-job communication. 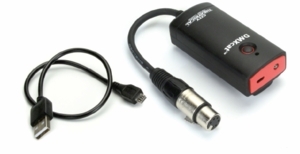 The device’s 5 pin XLRF connector/cable asembly allows it to be connected to a point in a DMX data chain to allow testing and or control of the various DMX/RDM channel functions. It is charged using a standard USB to Micro-USB cable and charger.